Today I'm diving right into the one thing performers and business owners have to deal with over and over again. It exists. It is a HUGE part of pursuing an artistic career or building a business. This past week, I was reminded of just how tricky it can be when someone turns down an offer or flat out criticizes what you felt was some of your best work. 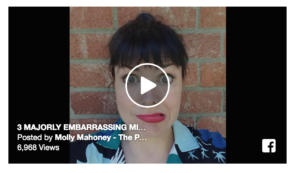 So… I posted list little video about the 3 MOST EMBARRASSING MOMENTS ON FACEBOOK LIVE. It was a funny video where I shared real #facebooklivefails… warning others so they could avoid these mishaps. 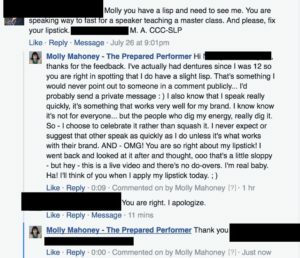 I also mention a Facebook Live Master Class in the video. (Which you can still sign up for.) The video had a great response. Loads of views, comments and likes etc. YOU HAVE A LISP AND YOU NEED TO SEE ME!!!??? As you can see… I refrained from going off, like some might have. When I shared this on my personal Facebook Page… it created quite a stir. SOOO I decided today's Facebook Live needed to address the topic of HATERS. Ha! Jump into the live convo by clicking the video below… or read on for the full story. This is not an unfamiliar topic. Check out the video below to see how I solved it! 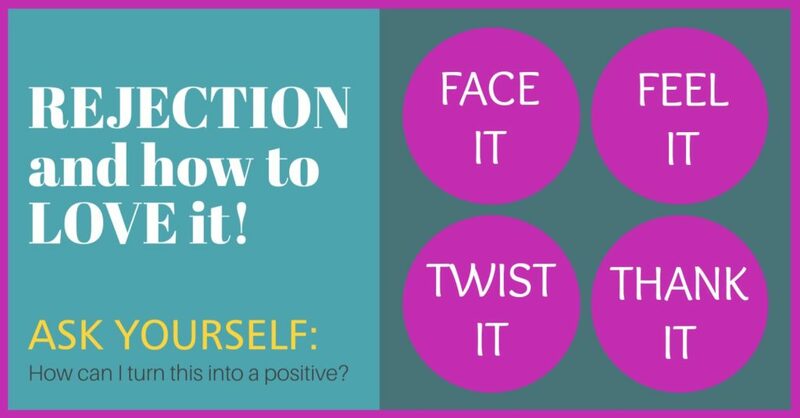 In prepping for my Motivation Monday video today… I came up with a way for you to LOVE rejection in 4 easy steps! I explain in the video… but for those who want the goods right away… here's a little infographic. This made me realize that my commitment to positivity in the face of disaster is something I've been working on for a LONG time. If you are on my mailing list, you may remember this amazing story…. They are stellar singers. They are astounding actors. They are super fierce dancers. The choreography is perfect for you stylistically. You have this callback in the bag. The choreographer explains that there is an 8 count of improvisation in the middle of this dance combo. He wants you to pretend like you are a “USO dancer in the 1940’s dressed in a turkey costume.” (Yes, you read that right.) After you get over the initial shock, you get that bubbly excited feeling in your chest, you know you got this! C. Cover your chest and give that number the best energy you've got. Standing with confidence accepting the fact that everyone in that room is mortified for you so you don't need to be mortified yourself! Well, I can tell you what I did. When this happened to me at an audition for South Pacific on Broadway. Oh yeah, lucky me! Wait… seriously tho, lucky me!! I took a split second pause and decided I'm gonna keep going. I not only finished the combination with more pizazz than I've ever given any dance combination EVER, when we were able to end in our own pose, I went straight to the splits and gave it a big TADA!! I thought to myself, if there is ever ever a time I'll get a call back, this is it!! Sadly, this is what was called the required call. So no one got a call back. Ha! (Broadway shows are required by the Actors Equity Union to hold periodic auditions, so that AEA members are able to be seen.) However, when I went to an audition for the same casting director a few months later, you had better believe I reminded her of the story. I walked in and said “Hi, I am Molly Mahoney, the girl whose top ripped at the South Pacific audition!” She instantly threw her hands in the air screamed for joy and told me it was one of her most favorite audition moments to date. Resilience my friends! You can’t beat it. I have SO MANY stories like this. Moments when I’ve fallen or I’ve seen someone fall, and been amazed by the recovery. If you can really thank the universe for the moments when you call and celebrate on the way up. You will put yourself in a position to succeed. 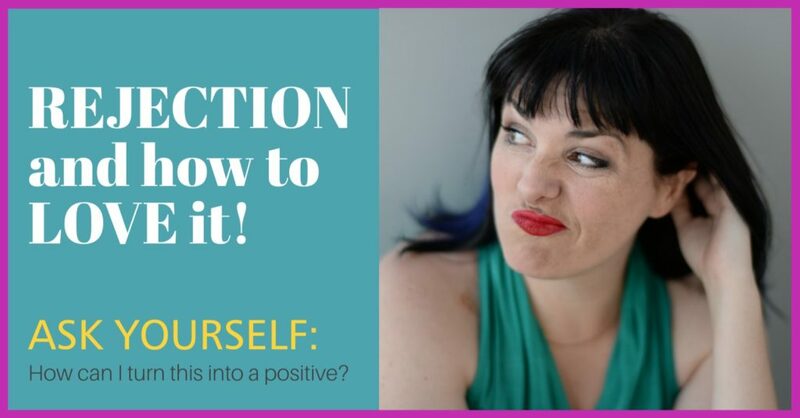 And finally – use Faebook Live as a way to practice putting yourself out there! Join me for a Free Live Video Master Class! I love your spirit! You have to be resilient and just go with the flow and have a good laugh for years to come…sometimes! Lol Molly! You are so funny and you write so well. I loved that you made me laugh so early in the morning. What a great way to start the day! I also believe in being positive. I choose happiness and a good laugh over sadness and a good cry any day unless I am at a good chick flick movie! Then let’s go for it. Kudos to you Mary Mahoney! Keep up the good work and slow down on the flashing unless of course you prefer “shock tactics!” You have a wonderful day Mary! Ha! I love it! Thank you for sharing Laurie! So glad you appreciated the joy!